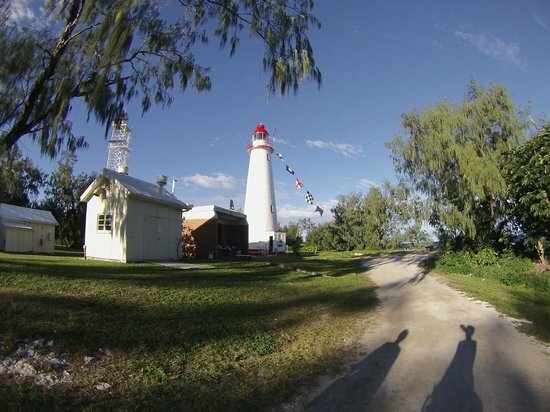 This small island is located 90 miles east of Gladstone on Queensland’s coast. It is one of many islands along the Great Barrier Reef. Captain Thomas Stuart who named it after his ship the Lady Elliot discovered it in 1816. There have been so many shipwrecks around the island that at one time it was dubbed, “Shipwreck Island.” These wrecks continued to occur even after a lighthouse was built on the island in 1873. Early entrepreneurs discovered the Lady Elliot was covered in phosphate rich guano from seabird droppings. Miners removed this layer--along with the island’s vegetation leaving a barren landscape. Early sailors who visited the island before the guano mining were afraid to come ashore. This was because at night wailing and moaning sounds were heard. An early belief was these sounds came from the ghosts of long-dead sailors whose ships had wandered too close to the island’s surrounding reef. Later when Chinese “coolie” laborers were forced to live on the island to mine the guano, the true source for these sounds was discovered. Seabirds--the mutton-bird-- that use the island at night as a rookery actually make these sounds. But the island is haunted. In 1896, Phoebe Phillips, the daughter of the lighthouse keeper, caught pneumonia and died at the age of 30. Some claim to have seen her ghost. Her remains share the island’s small cemetery with Susannah McKee who was the wife of a lighthouse keeper ten years later. Susannah who was from Ireland married Thomas McKee and the couple had four sons. When the McKee family moved to Lady Elliot Susannah found the living conditions unbearable. The hot climate and desolate landscape that had been stripped by the guano mining did not help. Supplies that had to be delivered to the island by ship were often late, and meat and other perishables would not keep. Susannah found the islands living quarters small and cramped and medical attention was not available. After her youngest son went off to boarding school--Susannah found the isolation overwhelming. Bored and alone Susannah put on her best clothes one day in April of 1907 and walked out onto the old guano-loading jetty below the lighthouse. She then jumped into the sea. She was 59 years old. Rumors swirled later that her husband was responsible for her death but there was no proof he murdered her. When her body washed up on the shore Thomas buried her next to Phoebe Phillips. Sadly, it appears Susannah spirit is trapped in this place she disliked so much in life. Her ghost was first seen in the 1930s. The keeper on the island at that time, Arthur Brumpton looked down from the lighthouse balcony one evening to see a female figure dressed in turn-of-the-century clothing. He watched as this ghost walked between the lighthouse and the 3 cottages behind it. His young daughter, Margaret also felt the presence of a stranger. She often heard ghostly footsteps in the lighthouse. When Arthur and his daughter left the island in 1940 the captain on the ship they were on showed them old photos of people who had once lived on Lady Elliot Island. They both identified Susannah McKee in one photograph as the woman they had seen. In 1985 the lighthouse was automated. The new resort staff that arrived on the island was charged with its upkeep. The resort manager, Tili Birkman immediately reported strange activity on the island that centered mostly around and in the 3 old cottages. Jeff Raynor was hired as a grounds keeper and Chris Lister was hired as a chef. The first day as these two men moved into one of the cottages they experienced this haunting. As they sat outside taking a break an empty plastic ice-cream container came flying out of one of the other cottages’ front door and landed at their feet. Later as the two described what they saw, Jeff expressed the fact he did not believe in ghosts. That night as he slept in the cottage he was awoken abruptly when he was hurled out of his bed--he landed on the floor with a hard bump. After this he slept on the cottage verandah instead. A few nights later he awoke again. To his horror he saw a transparent figure of a woman standing in the cottage doorway. Susannah’s ghost has been seen peering out of the cottage windows as well. 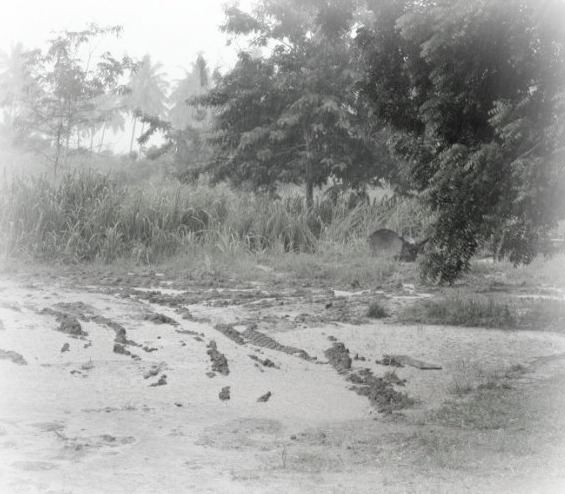 She is sometimes spotted walking across the island’s small airstrip. A team of painters contracted to paint the old cottages found every time they climbed on their scaffolding it began to shake violently, but as soon as they got down it stopped. 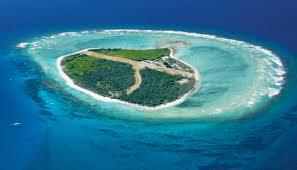 Today Lady Elliot Island is a world-renowned scuba diving destination and a Heritage site. The rustic resort only allows a small number of guests on the island at a time. Its reefs at high tide are spectacular. 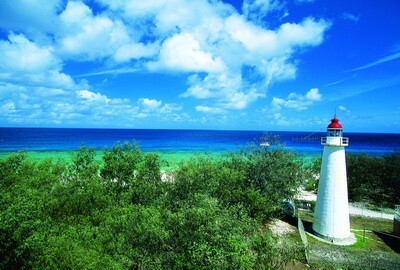 The island is a part of the Marine National Park Zone. 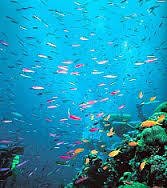 Since fishing is not allowed the variety of sea life seen is incredible. 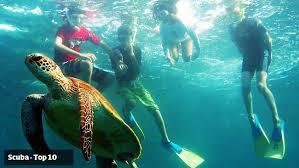 Glass bottomed boat tours are offered in the area. Two guests have also experienced strange activity. One woman camping in a tent awakened to the sound of zippers opening and shutting. When she got up and looked around no one was there. When she climbed back in her tent she realized the zippers were inside the tent. Another guest expressed an opinion he does not believe in ghosts. As he took the last swallow of his drink and put the glass down gently it shattered. A tour that includes the island’s cemetery is popular and most visitors are careful to pay their respects. 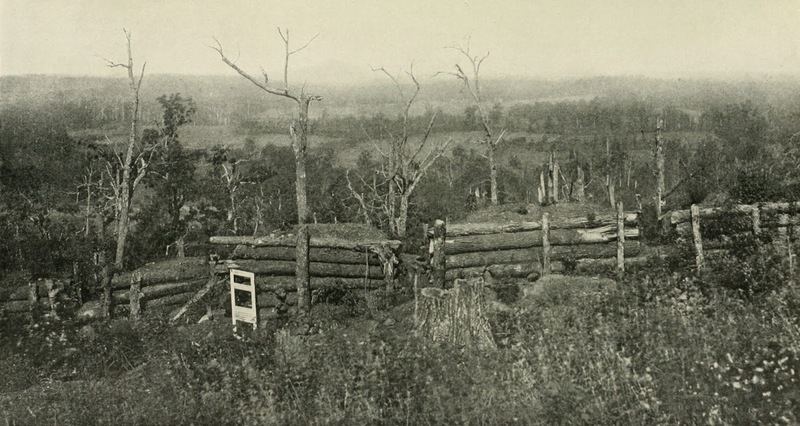 In June of 1864 in Cobb County, Georgia Gen. Joseph E. Johnson withdrew his army to a new defensive position astride Kennesaw Mountain during the Civil War. This location was just north and west of Marietta. Johnson chose this position in order to protect his main supply line to Atlanta--the Western & Atlantic Railroad. 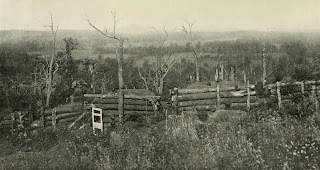 Before taking this position Johnson wisely had pioneers working through the night digging trenches and erecting fortifications, which turned Kennesaw into a formable fortress. Meanwhile, the Union commander, William T. Sherman having defeated Gen. John B. Hood’s troops at Kolb’s Farm on the 22nd nearby felt Johnson had stretched his line too thin. So Sherman decided a frontal attack was the best course of action against the Confederate bastion. After an intense artillery bombardment, Sherman sent his troops forward at 9:00 a.m. on June 27th. 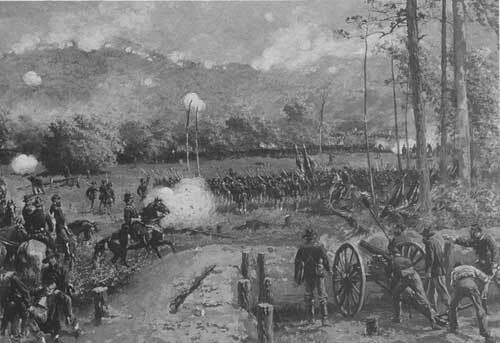 Determined Union troops came within yards of the Confederate trenches but were unable to break the Southern line. By 11:30 a.m. the frontal attack had failed. Sherman who later called Kennesaw “the hardest fight of the campaign to date,” lost 3,000 men. The Confederates lost close to 1,000. Almost as soon as this battle was over the ghost stories began. People who traveled through the area reported seeing soldiers on the battlefield and hearing the sounds of gun shots and cannon fire. 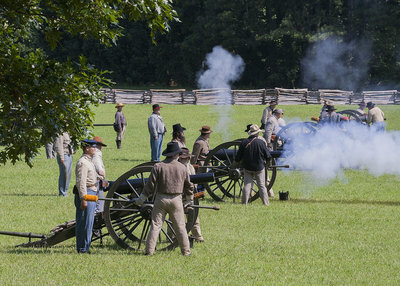 Recently, whole groups of people have seen groups of Civil War soldiers and thought they were watching a Civil War reenactment only to discover no such event was taking place. On the anniversary of this battle many have reported seeing smoke over the various battlefields. Often the smell of death and blood are noted. Housing sub divisions have been built on part of this battlefield. People have reported seeing Civil War soldiers in their houses and yards. 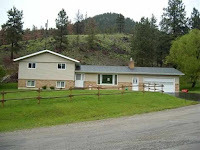 In another post a vivid account of an active ghost in one of these homes, entitled The Tatum Haunting can be found here. 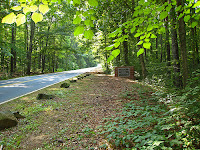 Today the area is Kennesaw Mountain National Battlefield Park. 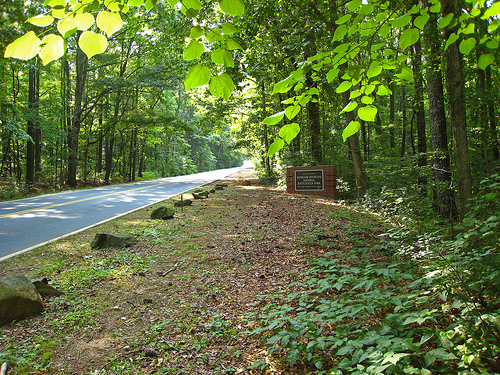 A ghostly sighting in the area happened to a father and teenage son who were driving through this park. They received the fright of their lives when a man in uniform riding a horse suddenly crossed in front of their car. The two realized what they were seeing was not a man but a ghost. The father hit the brakes as the apparition continued to move toward them. The image of the soldier was so clear that the father and son where able to make out the Union uniform he wore and the saber he carried. After the soldier crossed the road he just vanished through a fence. The father shared this story with Kevin Fike a ghost hunter. He told the father it was most likely a residual haunting. Residual hauntings often occur on battlefields--due to the fact strong emotions linger at these locations. As mentioned in other posts on this blog a residual haunting is when the activity does not interact with the living. This kind of ghost is actually unaware of the living. Instead, these scenes play out over and over again as if they are on a film loop. 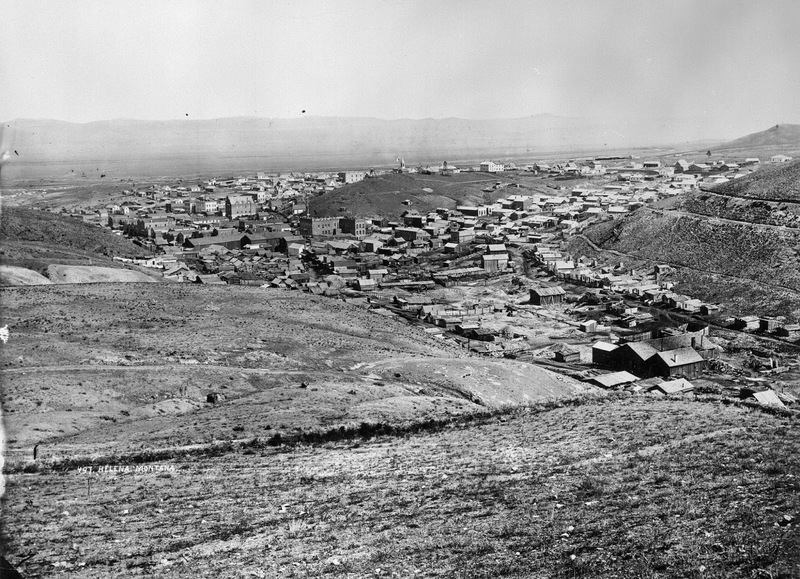 In Part l of this post the lawless days during Helena, Montana’s gold rush era is recounted. 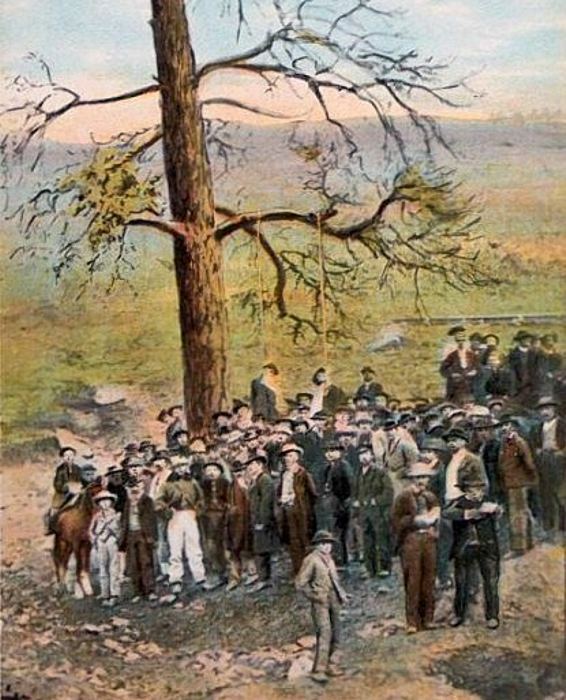 This community had a Hanging Tree were more than eleven men were hanged by vigilantes in the mid-1800s. In 1875, a Methodist minister, Reverend W.E. 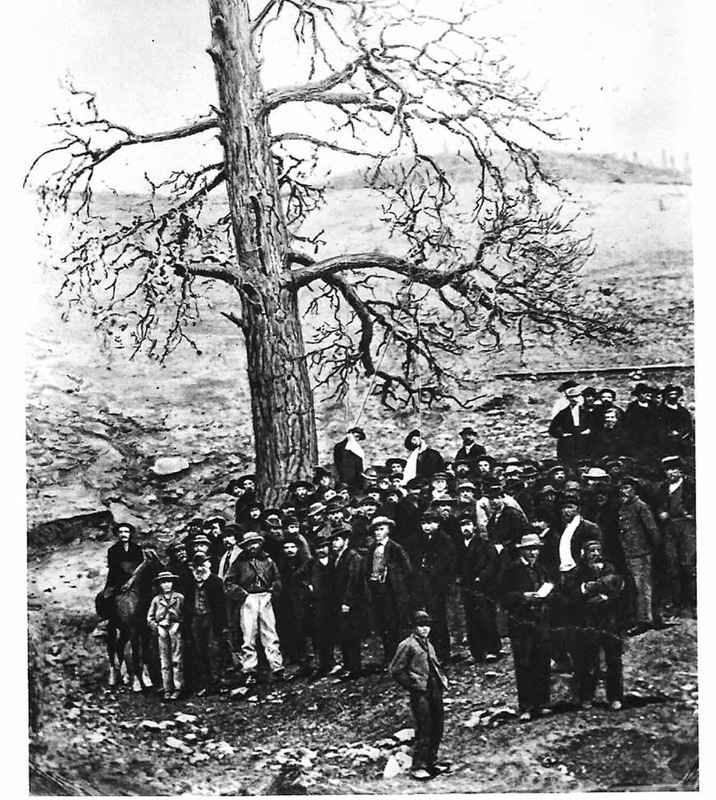 Shippen who owned the land where the large Ponderosa pine Hanging Tree was located arranged to have it chopped down. Despite a public outcry, he followed through--most likely to get rid of this macabre symbol from a time when citizens in the community took the law into their own hands. By the1880s other homes were being built in this area. In 1900, a workman digging in a backyard in the area near where the tree once stood discovered a grave. In 1931 yet another grave was found close to the first. It is believed these were the bodies of two men who were hanged. The boots worn by one identified him as James Daniel who was hanged in 1866. It was his body Mary ‘Molly” Sheehan (Ronan) saw hanging from the tree. Ronan’s account is shared in Part l of this post. Shippen’s house still stands and today a new neighborhood surrounds it. Residents for the past 145 years who live near where the tree once stood state “intense emotions” linger. They feel that many of the men who were hanged do not rest in peace. The earliest encounter with a ghost happened in September of 1872 before the tree was chopped down. A resident had stayed late to finish his work. It was dark and snowing when he headed home. But a strong force compelled him to change directions, and he found himself standing in front of the Hanging Tree. What follows was published in a letter to the editor of the Rocky Mountain Gazette. It is a wordy account, so it is paraphrased. As his eyes adjusted to the darkness, he could see the trees stark and lifeless outline. He spotted the form of a man. He was hanging a few feet below a lower limb. After a momentary panic, he regained his composure and moved closer to the tree. 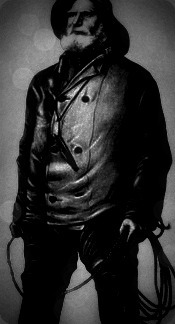 The figure was dressed in black clothing, and his back was turned away from the witness. The man saw no rope extending from the limb. The figure was suspended in mid-air. He saw the form was not solid but instead was transparent. Suddenly the figure raised its arms and changed position. He could now see its face--it was a ghostly pale white. The figure spoke two words, “October 7th and then disappeared. With this initial sighting, some feel this set the other spirits that were hanged “free.” This is believed because for many years people have experienced strange events in the neighborhood. One house along Hanging Tree Gulch Rd today. Activity often encountered includes: voices heard outside at night, footsteps in people’s attics and marbles found in homes as well as their gardens. 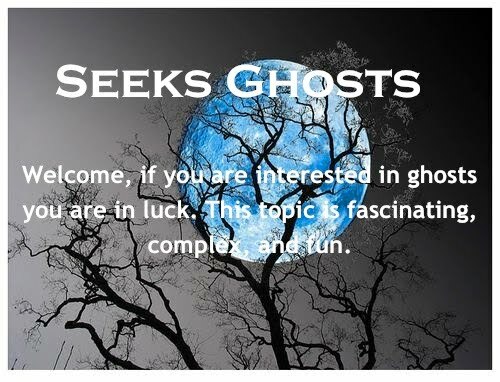 This last is connected to David Hilger and his friends playing marbles under the Hanging Tree--which is described in Part l.
The Jones family who lives in the area state they do not believe in ghosts but every time their daughter visits them she hears the voices outside. One house in the neighborhood was remodeled recently. A crew of workmen who applied new drywall and plaster left soon after to let the walls dry. When they left the house, it was locked securely, and no animals were inside. When the workmen returned, they found “claw-like” scratches marring every wall. The plaster had to be reapplied. Herb Dawson, an architect, has experienced several odd things in his home located in the Hillsdale area. He like many others has found the mysterious marbles throughout his home and on his front porch. One of his most frightening experiences occurred as he was stripping the paint from his parlor’s woodwork. A knife on the mantle behind him flew across the room and hit the wall inches from his head. Hector Cano and his girlfriend live near Herb Dawson. He has also heard things he cannot explain. One night while laying in bed a noise woke him up. Cano asked him what he was talking about and as he looked up he saw a tall bald man with four others standing behind him. The tall man was trying to get hold of the young boy. 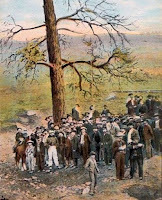 In Part l of Helena: The Hanging Tree, more information about the hangings is shared. 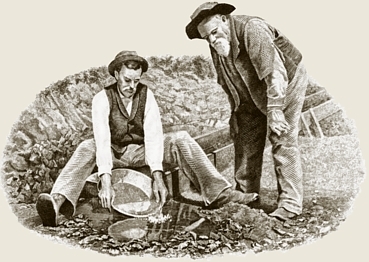 Law was slow in coming to the Montana gold camps in the mid-1800s. The gold rushes brought a myriad of unsavory lawless characters into Montana territory. With no law enforcement present “miner’s courts” were established but they were ill-equipped to handle the crimes that occurred in these wild camps and settlements. The result was vigilantes took the law into their own hands. 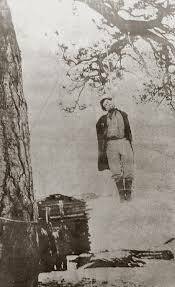 In the span of a few short months from late 1863 to early 1864 vigilantes hung two- dozen men. 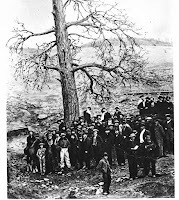 Helena, Montana one of these early settlements was known for its Hanging Tree or Murderer’s Tree as it was known. 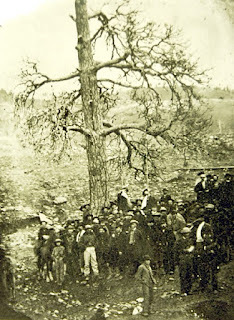 More than 11 men were hanged on this tree from 1865 till 1870. This lone ancient large Ponderosa pine stood east of the settlement at the head of Dry Gulch. Its bare massive lower branches--twenty feet above the ground-- reached out in a tangle. The Hanging of Compton and Wilson. 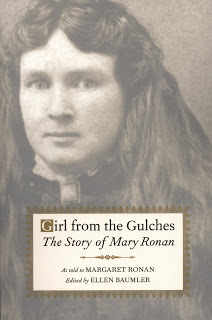 Twelve-year-old Mary “Molly” Sheehan, later to become Mrs. Peter Ronan recalled coming upon one of these hangings on her way to school in 1865. At the age of 70, she described the sight--it being fresh in her memory--something she could not forget. This body was left hanging for three days as a warning to others. David Hilger was a youngster when his family moved to Helena in 1867. He recalls climbing the Hanging Tree’s dead branches where rope burns were evident on the lower limbs. He and his friends played marbles under this tree. One afternoon in 1870 as they played their game was interrupted. Arthur Compton and Joseph Wilson were about to be lynched by an angry mob for robbery and attempted murder. George Leonard, their victim, was a quiet German who lived near Bear Creek along the Missouri River. Leonard had traveled to Helena to buy supplies. He stopped off in Reed’s Saloon for a few drinks. Compton and Wilson rented horses and watched and waited. At 6:00 p.m. Leonard headed home on his horse. Compton and Wilson waylaid him at Spokane Creek. They fired 7 times hitting him only once in the hip. When Leonard fell from his horse they pistol-whipped him around the head and left him for dead. But Leonard did not die. David Hilger recounts an angry mob fueled by vigilantes approached the courthouse where the two men were confined. The crowd forced their way in and took the two men to the steps of the courthouse where they conducted an impromptu trial. The two men’s fate was sealed. They were marched to the Hanging Tree where they were put in a wagon standing on a dry goods box. Their hands and feet were bound together. Then they were asked if they had any final words. Wilson remained silent, standing erect and motionless. Compton however, said, “Boys, goodbye. Don’t lead the life I have the past few days.” He had to be supported on the box because his knees were shaking. Then the "all ready" was given and with a quick stroke of a horse’s back, the wagon lunged forward. The two men’s bodies were swinging in the air. Compton’s neck was broken in the fall, but Wilson was not so lucky. The noose had slipped to the back of his neck, and he died of strangulation. Both men were pronounced dead after 15 minutes. The Vigilante hanging of Compton and Wilson. The crowd did not disperse until the bodies were cut down and buried. 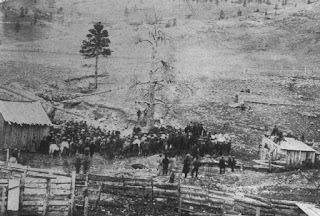 Compton and Wilson were the last two to be hanged on this tree. Future executions were done on the gallows at the courthouse. Afterward, David and his friends went back to playing marbles under the tree. 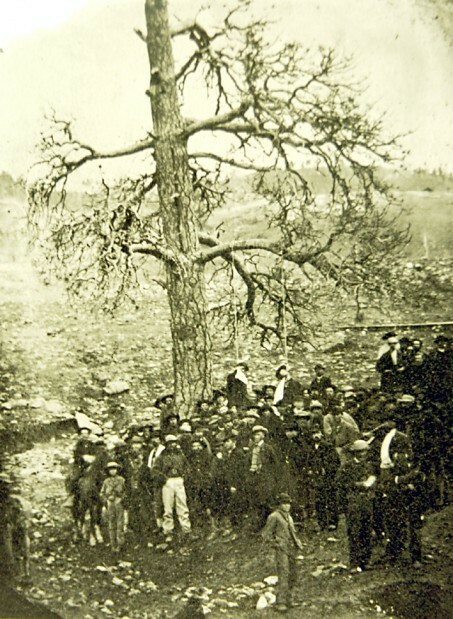 In Part ll of Helena: The Hanging Tree, the tree is chopped down, and a new eyewitness account of a ghost sighting is shared along with more recent sightings. All are scary. In the early 1900s two sisters traveling home from Cape Cod found themselves stranded when their car broke down. They were out of luck for it was a stormy night and it began to rain. Seeing an old house nearby they made their way through the mud and weeds and tugged on the door pull. Since no one answered they looked through a broken window and saw a library. It was covered with dust and neglect. They tried the front door again and found with a brisk push it opened. With no other choice the sisters decided they would stay in the house until the morning when they could find someone to tow their car. They risked the mud and rain to retrieve some blankets and snacks from their car and settled in for the night. Awakened suddenly several hours later by an loud noise that appeared to be coming from the once grand fireplace in the room they were startled to see a bedraggled sailor--he appeared to be a captain-- whose clothes were dripping wet. He stood near the fireplace and appeared to be drying himself by a non-existent fire. It was dark in the room but the sailor was glowing brightly. The captain then muttered something they could not hear and disappeared. Deciding they must have imaged it the sisters went back to sleep. The next morning they found a pool of salt water and wet seaweed by the fireplace. But there were no footprints in the dust that had settled on the ground except their own. The sisters hurried out of the old house. They managed to flag down a passing motorist and get a ride into the nearest town. Curious they asked about the abandoned house. They were told no one had lived there for years. The son who would have inherited it was lost at sea and the family had moved away because they claimed strange things happened in the house at night. Before they left the house that morning the braver sister had tucked the seaweed they found into her pocket. Months later at a dinner party the sisters told a museum curator about their mysterious encounter. To the surprise of the one sister the other mentioned she still had the seaweed. The curator arranged to test it for them. After several days they received a message from this man. It simply said that the seaweed they had found in the house was a rare type that only was found on dead bodies. This is the strange tale of a blood stained dress, Lincoln’s ghost and a young couple that witnessed his assassination who afterwards experienced their own tragedy. Major Henry Rathbone was the son of a successful Albany businessman who made his fortune from making and selling stoves. His fiancé, Clara Harris was the daughter of US Senator Ira Harris. Rathbone and Harris were invited to join Lincoln’s party at Ford’s theatre the night he was shot by Booth. This young couple had seats in Lincoln’s box. The Major jumped up and tried to detain the assassin but Booth pulled a knife out and deeply slashed Rathbone’s arm, he then escaped by jumping to the stage. 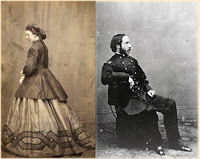 The white satin dress Clara wore was splashed with Lincoln’s and her fiancé’s blood. Rathbone and Harris after this traveled back to Albany and were married. They had three children. 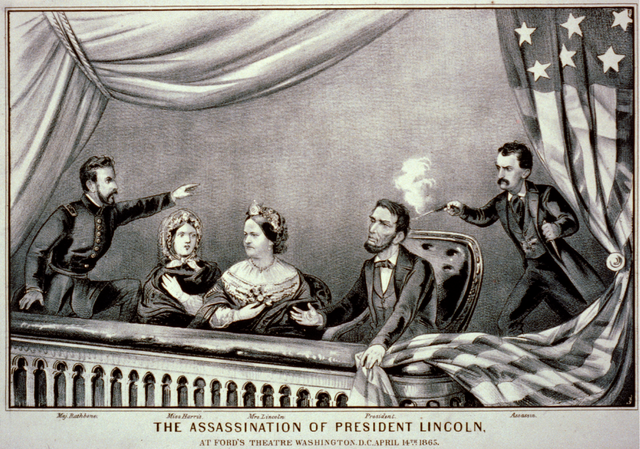 But witnessing Lincoln’s assassination appeared to taint their lives. Clara could not wear the stained dress again, but just getting rid of it didn’t feel right to her. Unfortunately, every time she saw it, bad memories of that terrible night flooded back. The shot that rang out, the splashed blood, her fiancé’s valiant attempt to catch the murderer, the flash of Booth’s knife as it sank into Henry’s arm, her voice that demanded water for the president. Even when the couple was preparing to sell their Albany home, Clara could not face getting rid of the gown. Her solution was to have the closet the dress was in sealed off with bricks. Henry’s path after the assassination was one filled with a dark depression, which eventually manifested into a mental illness. The Rathbones in 1882 moved to Hanover, Germany a part of an ongoing quest to seek aid for Henry’s sad illness. Before dawn on Christmas Eve morning in 1883, a pale thin Henry who now complained of constant headaches came into his wife’s bedroom fully dressed. He told Clara he wanted to be with their children. She reminded him of the early hour. Members of the household awakened by their voices entered the bedroom to discover Clara dead and Henry lying on the floor with multiple stab wounds. In a kind of eerie repeat of the assassination they had witnessed eighteen years earlier Henry had taken a revolver and shot his wife and then stabbed himself 6 times. Back in Albany, at the Rathbone’s former house, with the bricked-up closet, witnesses reported a variety of strange happenings. A shot was heard ringing out on the anniversary of the assassination, people claimed to see the ghost of Abe Lincoln and a sobbing woman was seen wearing blood-soaked attire. These rumors were so prevalent in Albany that in 1929, Mary Raymond Shipman Andrews wrote a story called The White Satin Dress based upon this haunting. 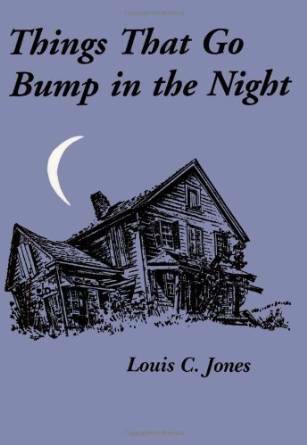 Louis C, Jones who wrote, Things That Go Bump in the Night grew up in Albany. He remembers one story that was told often. A family who were descendants of the family who occupied the house after the Rathbone’s moved out had one houseguest that experienced this haunting. They were related to the then Governor of Massachusetts. He was pondering a political problem while he visited them. A bill that had been passed in his state was causing a heated controversy. He was having trouble falling asleep worried whether he should take the side that would be politically expedient for his career or do what he considered to be the right thing. He finally fell asleep to be awoken abruptly. There was someone in the room with him. He raised himself up on his elbow and saw the figure of Lincoln standing in the moonlight. Lincoln appeared to be calm and had an understanding smile upon his lips-- he then just vanished. The governor turned to switch on the light and a book of Lincoln’s speeches fell to the floor. As he picked it up and saw these words, “Hew honesty to the line; let the Lord take care of the chips.” The governor stuck to his guns and supported the bill. He was re-elected and went on to serve his state more ably than before. The family that lived in the house was skeptical about what he saw but during a renovation in the bedroom he had stayed in they found the tiny closet that had been closed off. In it was the dress with Lincoln’s bloodstains. They sealed it back up. * In 1952, in accordance with German cemetery policy regarding graves long unvisited, the remains of the Rathbone’s were dug up and disposed of. This might be why Clara Rathbone’s ghost also haunts her old home in Albany. The Rathbone’s oldest son, Henry Riggs Rathbone was 13 years old when his mom died. Clara’s brother then raised him and his younger brother and sister. He grew up to be a US congressman. He proposed Ford’s theatre be turned into a museum--which it was. 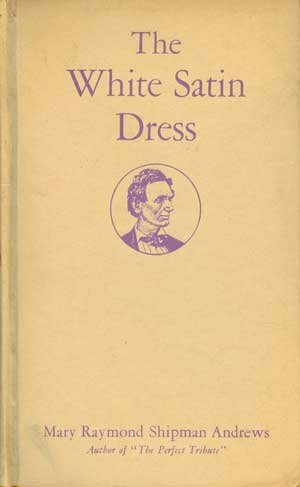 In 1910, just one year before his father's death, Representative Rathbone broke down the bricks that enclosed his mother’s white satin dress, which had been worn 45 years earlier. He burned it--saying it had cursed his family.